A vision of grace and beauty in our backyard a couple of days ago. A stroll through the yard and out again. No nibbling of flowers, berries, or vegetables. Remembering their visit last year. What’s with the silly word play with rain and reindeer? Well, we are having our first rainy day here in over a month and it makes me happy. July broke the records for the sunniest and driest July ever, and one that was too hot for me. We are hoping for enough moisture in the ground to help our gardens and lower the forest fire risks around this province. They do look lovely, and you are lucky that they simply strolled, not snacked! We too had a doe and fawn the other morning at dawn. I do like seeing them, but I do object to having all my plantings consumed, so now we and our neighbours are fencing off the vegetable patches. Other than that we shall have to learn what deer do not like to eat. Great that you too are having rain – our rain barrel is full again, so I don’t have to use tap water on the tomatoes. And of course it is cooler overnight. Olga, yes, I’m lucky, at least this time. Perhaps they were not hungry, probably having feasted in another garden previously. They can often devour everything, as happened recently to my daughter’s garden near Victoria where they left only a hot pepper untouched. I read somewhere that very aromatic herbs, garlic and some onions planted around their favourites may help. And of course a very high fence is best. As for rain, it’s not been enough to fill a rain barrel and the forecast is calling for a return to sunshine. Hmm, a *very* high fence. I once watched several white tails vault easily over a 10-foot fence! They are lovely to see, though they do cause a lot of problems. Anyway, so glad you finally got some rain. I hope August is much more seasonable! Leslee, yes 10 to 12 foot fences are what some friends in Victoria and another daughter in the Interior have built. The deer can be standing right next to the fence, then jump straight up and over without having to make a run first. They are a huge problem on Vancouver Island and many of the Gulf Islands. Fingers crossed that they don’t become so around here. I have seen two sets of doe with their fawns this year. One the Moms, has twins and they are so fun to watch when they start prancing around. Managed snag a few pictures of them too. They are a lovely pair indeed. I hope the cool, moist days are there to stay for as long as you need them to be. Cathy, you’ve been most lucky to see so many of these truly beautiful creatures and to get photos too. Thanks for visiting! Such beautiful, graceful creatures – but didn’t know they were that expert at the high jump. Commiserations on the lack of a decent rainfall. Here’s hoping! Tom, they are amazing high jumpers. We had some heavier rain overnight and the garden is now looking like it’s had a good drink. Oh, no! 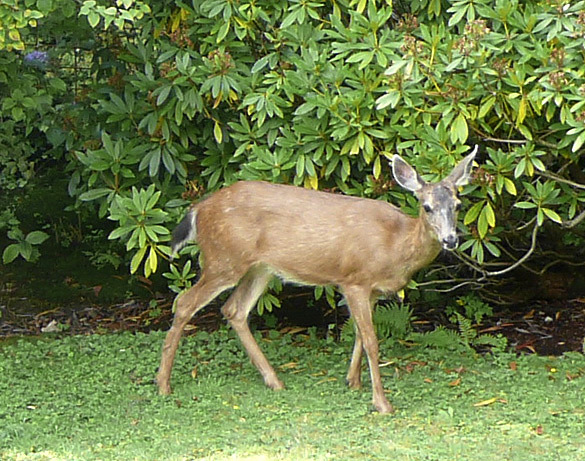 I stand corrected re nibbling – a couple of days ago I discovered they have visited again and feasted on some impatiens and many hostas along the back fence, in the general area these photos were taken.